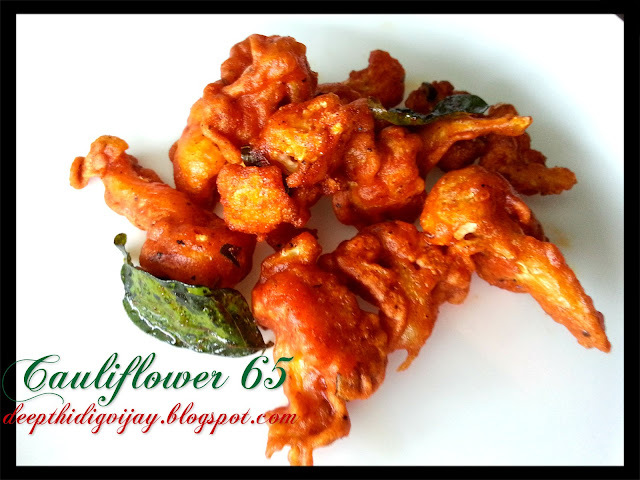 Mix all the ingredients in a bowl with water and the batter should be of a bajji batter consistency the pour this mixture on to the washed and dried cauliflower. Deep fry them in oil in batches and take them out when they turn golden brown. If you want your dish to be crispy you will have to fry then again under medium high flame for 20sec and remove them. You can also fry some curry leaves and garnish on top while serving them. Looks very good.. Crispy & yummy ! Wow this simple gourmet recipe is awesome!